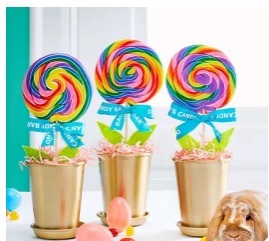 If you are looking for some DIY ideas for some decorating fun this Easter, Target.com has some super-easy projects with simple instructions you may want to check out. My favorites are the Lollipop Blooms and Peep Centerpieces. Both are fun and easy to make with very easy instructions. The best thing is you can pick up everything at Target. You can also find decorating ideas and some other tips and inspiration for a fun & festive Easter Holiday.